Cruise along the peaceful Danube River through Hungary, Slovakia, Austria, and Germany-stopping at some of Central Europe’s most splendid capitals and charming towns along the way. Begin this timeless European river cruise in Budapest, where guided sightseeing acquaints you with the highlights of the vibrant capital of Hungary. Set sail on the Danube, take pictures of the impressive Parliament Building as you leave Budapest, and head for Bratislava, the capital of Slovakia. Here, enjoy a guided walk through the delightful Old Town and visit the gothic St. Martin’s Cathedral. Vienna, Austria, the "City of Music," makes an immediate impression with its lavish Habsburg Imperial Palace and neo-renaissance Vienna Opera House. 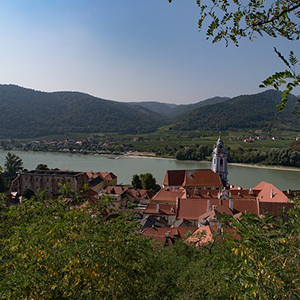 Enjoy the magnificent views as your river cruise takes you through the picturesque wine region of the Wachau Valley, with stops for a guided walk in Dürnstein, a visit of the impressive Benedictine Abbey of Melk, and a tasting of some of the renowned local wines. In Linz, walk around the Hauptplatz, Austria’s largest medieval square, which forms the center of the city, and be sure to get a photo of the splendid Trinity Column. Passau, Germany, the "City of Three Rivers," is uniquely located where the Inn, Ilz, and Danube rivers converge. It has a maze of narrow cobblestone streets lined with beautiful Patrician houses, and St. Stephen’s Cathedral, a masterpiece of baroque architecture. A memorable last stop on this delightful Danube River cruise vacation!